The architecture of the Station is typical of a certain era; it clearly reflects the original use of the building. Its simple rectangular footprint could readily be adapted to a wide range of contemporary uses. The original construction - essentially a large pavilion on posts - allowed for re-arrangement of interior spaces without much demolition. When the stables were created in the 1970's most of the interior space and structure was demolished, including the four support walls partitioning the baggage room, concession areas and post office area. Besides the studio apartment on the south side, the four stables on the east side underneath the former overhang (plus one inside stable) and the garage area on the north side, the interior space was made into one room in the 70's. A rather improvised attic support structure using four large off-center posts, held up the center attic floor. The unpainted ceiling beams and posts are part of the 1970's changes; the white beams are from the original ceiling support. The plates on top of the original partitioning walls are still visible in the ceiling. The renovated interior space goes back in some ways to the original configuration: a self-contained north and south side, and a separate center. The 1-bedroom apartment on the south side - constructed in the sixties - has been completely renovated. The original pass-through space on the north side remains enclosed and continues to function as a garage and storage area. 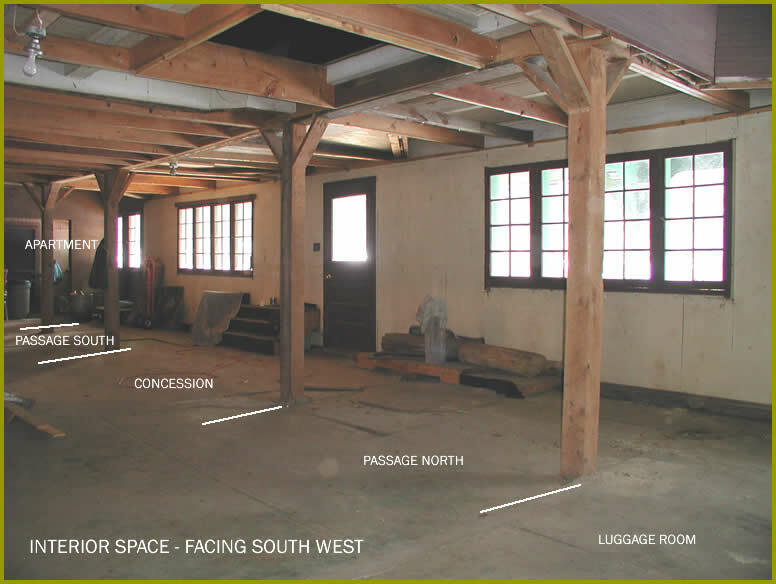 The former baggage room is once again partitioned off from the center and is used as a workshop and instructional space for the Sacandaga Sailing School. The center of the building is now separated from the south side apartment by a fire wall. The layout of the center interior space allows for easy re-configuration for a number of uses: a 3-bedroom rental cottage for tourists; an exhibit space; meeting space; private parties; fundraisers etc. Its long-term use is likely to be a clubhouse for the residents living on the rest of the property. Parts of the original partition walls of the center concession area have been re-built to maintain historical integrity. The four stable areas that were enclosed in the sixties now accommodate a bathroom, half-bath, utility space and two good size (bed)rooms. A large open kitchen connects with the main space. A room size area can be partitioned off from the main common space to create a third (bed)room separate from the main space. A set of stairs leads to the center attic. The 1200 sqft attic will eventually be used as an exhibit space, meeting room, small movie theater or as a large indoor play area. Click here for interior photos and rental information.